There's a new CAS challenge over at The Outlawz and the theme is pumpkins. Good, another chance to use a fun and favorite bundle, Pick a Pumpkin. In the background you'll see some stamped off images from the set Timeless Textures. This card actually went together rather quickly, in between the pauses to watch football, hockey and baseball! I do like my sports!! Below is a complete list of products and links directly to my store. Are you ready to see 5 Christmas cards, each one using the same supplies but all 5 of the latest in-colors?!! Well they sure were easy to make. First up is Berry Burst. Here's a list of supplies that can all be found at MY STORE. I know, I know, it's been forever since I last posted. So much has been going on and I simply haven't been getting inky. Tonight I decided to turn on the hockey game (I'm a big Pittsburgh Penguins fan) and make something. Some refer to my style as clean and simple...I like to say it's quick and easy!! 10 minutes was all this card took thanks to the Pick a Pattern Washi Tape. I even included a scrap of Gold Glimmer Paper that I almost threw away (GASP!!). I used the Cat Punch from the Spooky Cat bundle (gosh I love that thing!!) 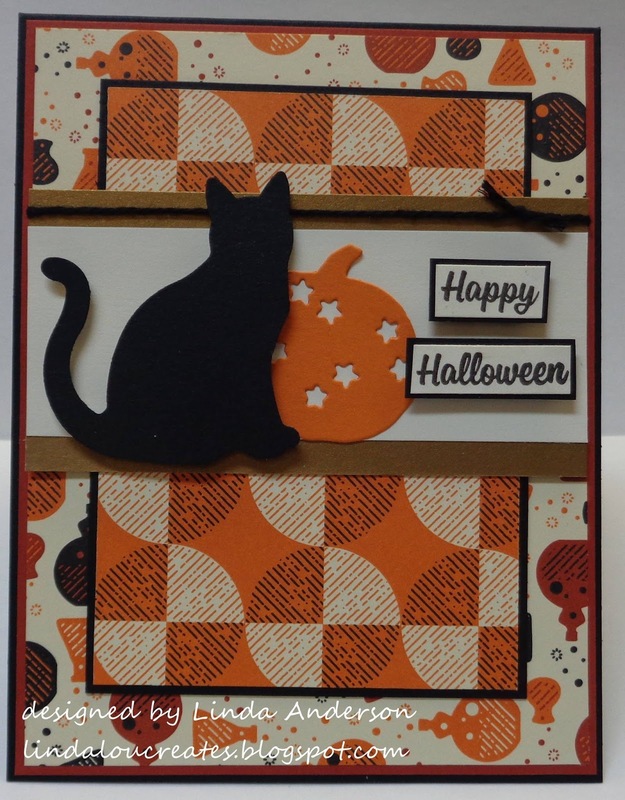 and the sentiment from the Spooky Cat stamp set (also part of the bundle). I think I must make a few more of these...they were that quick and easy!!! For these and any other Stampin' Up products, please head to MY STORE. Yes, I'm making Christmas cards!!! I like to make 'em throughout the year. This is a fun one that looks like a lot of work but really isn't. I started off die cutting out from masking paper several snowflakes from the Seasonal Layers Thinlits Dies. I then stuck them down onto a piece of Whisper White and sponged Powder Pink and Bermuda Bay ink over the entire piece. Then the magic happened when I peeled off the snowflake masks!! So as not to take away from the fun background, I went simple with the rest, stamping a sentiment from the Labels of Love clear mount stamp set and cutting it out with the Layering Circle Framelits Dies. The Bermuda Bay scallop layer is also from those Layering Circle Framelits Dies (you get a lot of bang for your buck with these!). I added the cute little Silver 1/8" Ribbon bow for a perfect little accent. This circle layer was then popped up using Stampin' Dimensionals onto a gorgeous silver Foil Snowflake found in the Holiday catalog. Cardstock used includes Powder Pink, Bermuda Bay, and Thick Whisper White (perfect for a card base). If you are interested in any of these products, links have been provided. Place an order of $35 - $49.99 AND use hostess code RBWU3VME, you will receive a spool of Baker's Twine free (color of your choice). If your order totals $50 or more AND you use hostess code RBWU3VME, you will receive from me a pack of Black Rhinestone Jewels FREE!! Lots of specials going on right now that you don't want to miss out on. Check 'em all out HERE!! Where have I been?!!! Time sure has a way of flying by! I made this card today for a Halloween challenge in a SU Facebook group I'm involved in. Of course I had to use the Spooky Night Suite!! I love that collection of stamp set, cat punch and designer series paper. I even included a die cut from the Patterned Pumpkins thinlits...love those cut out stars. Now if you are interested in any of these products, feel free to stop by my website HERE and start shopping!